Unlimited Class racing at the National Championship Air Races, held each year near Reno, Nevada, is truly one of the ultimate motor sports events in the World. 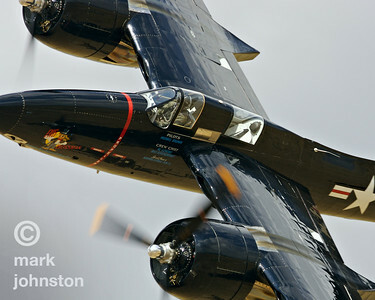 With up to eight aircraft racing over a nine-mile oval course 50 feet above the Nevada desert, Reno Air Racing is a must for aviation buffs, race fans - and anyone who loves horsepower, speed, and competition. Racing is divided into classes, with similar aircraft competing against each other under established rules. 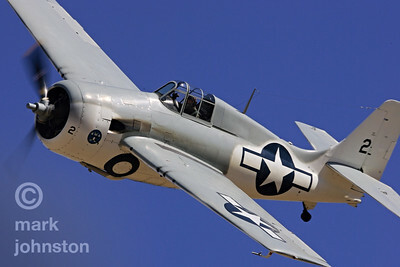 The Unlimited Class is comprised mostly of WWII-vintage fighter aircraft, some of which have had their wings, clipped, airframes smoothed, canopies reduced, and undergone other modifications to reduce drag, and at the same time specially-built engines have been built that develop significantly more horsepower than the original power plants. The result is that Unlimited Class aircraft now reach into the 500 mph range at Reno, racing over the desert at 50 to 100 feet. 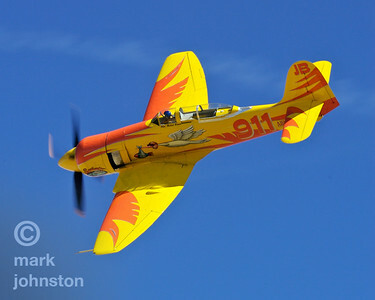 Other racing classes include smaller Biplane and Formula One aircraft, vintage trainers such as the North American AT-6, modern Sport aircraft, and even Jets. 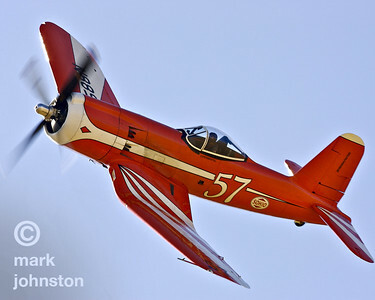 Mike Brown's flaming red racer, a modified Hawker Sea Fury named, "September Fury", won the 2006 Unlimited Class at the National Championship Air Races at an official speed of 481.619 mph. 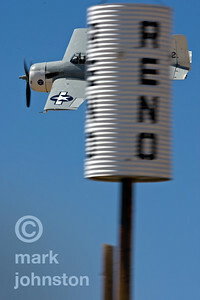 Robert Odegaard and the very unique F2G-1 "Super Corsair", Race 57, racing in the Unlimited Class at Reno. 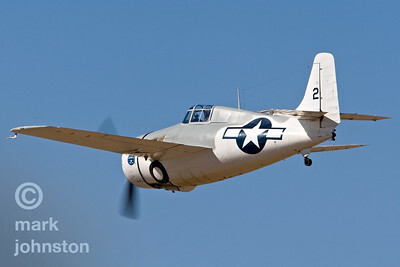 This aircraft was the fifth F2G-1 and was built in 1945, and retired from military service in January 1948. Ben McKillen, Jr. flew the aircraft as Race #57 to third place in the 1949 Thompson Trophy Race at a speed of 387.589 miles per hour, finishing behind Cook Cleland flying another F2G. McKillen won the 1949 Tinnerman Trophy Race in Race #57 at a speed of 386.069 miles per hour. Odegaard acqiured the aircraft in 1996 and returned it to airworthy condition in 1999. 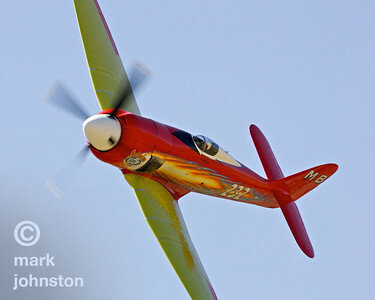 The highest official speed posted by Race 57 during the 2006 National Championship Air Races was 370.020 mph. 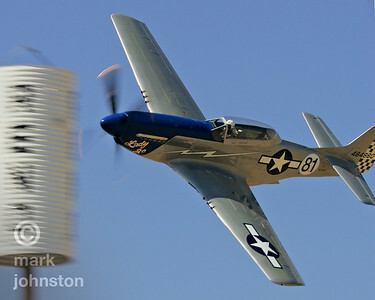 "Lady Jo", a North American P-51D Mustang, rounds pylon 7 during the National Championship Air Races and Air Show in Reno, NV. 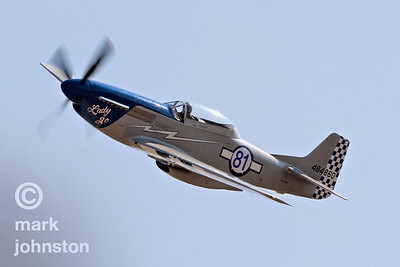 Jimmy Leeward's P-51D Mustang "Cloud Dancer" has been campaigned at Reno in close-to-stock configuration since 1978. Recently, Leeward has made various modifications in search of a few more mph. In 2006, the aircraft sported a half-covered canopy and special wingtips, and posted its fastest qualifying speed ever: 434.887 mph. 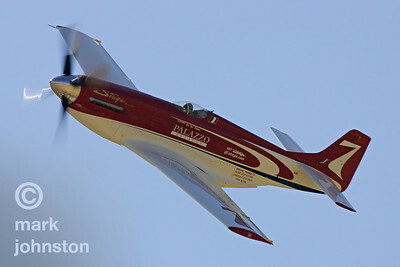 Ron Buccarelli's Rolls-Royce Griffon-powered P-51D Mustang "Precious Metal" sports contra-rotating propellers [propellers mounted in the same engine, but turning in opposite directions]. "Precious Metal" finished third in the Unlimited Class Silver race in 2006 with an official speed of 391.366 mph. 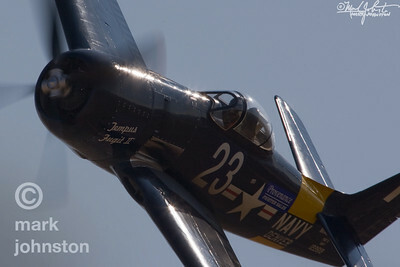 Another of Mike Brown's aircraft, the rare Grumman F7F Tigercat, named "Big Bossman", Unlimited Class Race 1. 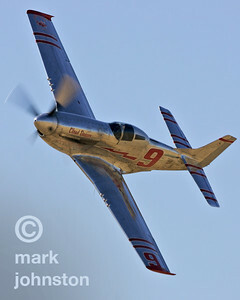 While not among the fastest of the Unlimited Class aircraft, "Big Bossman", as one of the largest racers, is always an impressive sight motoring around the race course at Reno. 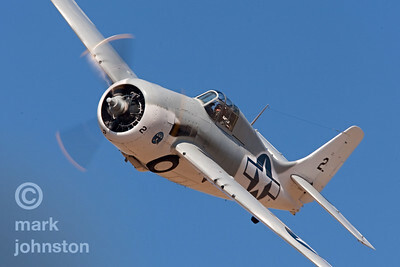 Another of Mike Brown's aircraft, the rare Grumman F7F Tigercat, named "Big Bossman". 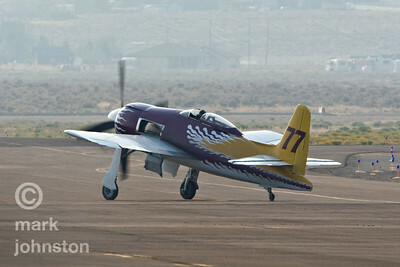 While not among the fastest of the Unlimited Class aircraft, "Big Bossman", as one of the largest racers, is always an impressive sight motoring around the race course at Reno. 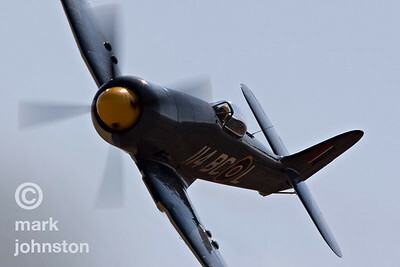 Hawker Sea Fury "September Pops" flies the race course at the 2006 National Championship Air Races & Air Show. 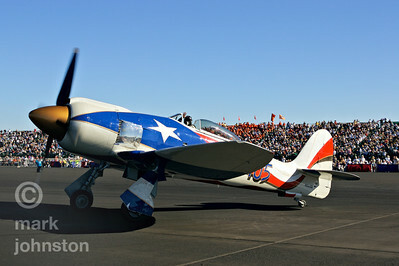 Stu Dawson's Hawker Sea Fury "Spirit of Texas" received a patriotic Texas paint job in 2005. Here, Dawson taxis "Spirit" out for the 2006 Unlimited Class Gold Race, in which they placed fifth at a speed of 428.753 mph. 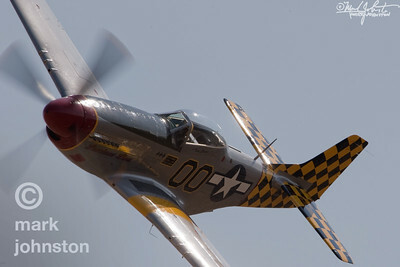 Although she dropped out during the fifth lap of the championship race with engine trouble in 2006, Tiger Destefani's North American P-51D Mustang, "Strega", has racked up an impressive six Unlimited Class championships at Reno, and remains a fan favorite. 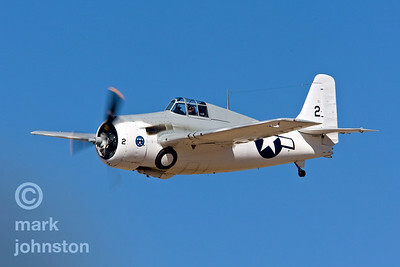 Tom Camp's Grumman Wildcat, while one of the slowest of the Unlimited Class racers, is still a treat to see on the race course and on the ramp at the Reno Air Races. Ron Buccarelli's Rolls-Royce Griffon-powered P-51D Mustang "Precious Metal" sports contra-rotating propellers [propellers driven by the same engine, but turning in opposite directions]. "Precious Metal" finished third in the Unlimited Class Silver race in 2006 with an official speed of 391.366 mph. 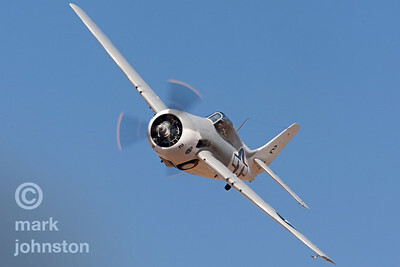 Tom Camp's Grumman Wildcat, Unlimited Race 2, "Air Biscuit", while one of the slowest of the Unlimited Class racers, is still a treat to see on the race course and on the ramp at the Reno Air Races. In 2008, Camp and "Biscuit" qualified at 303.954 mph and went on to finish fifth in the Unlimited Bronze Race at a speed of 264.434 mph. 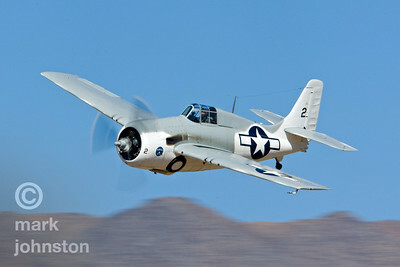 Tom Camp's Grumman Wildcat, "Air Biscuit", Race 2, while one of the slowest of the Unlimited Class racers, is still a treat to see on the race course and on the ramp at the Reno Air Races. Here, Camp flies "Air Biscuit" during the Unlimited Bronze Race on 16 Sept 2007, finishing at a speed of 280.516 mph. 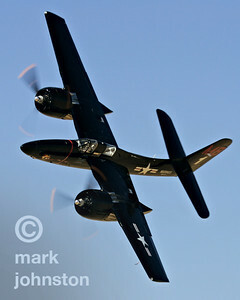 Dave, Morss flying Unlimited Cass Race 23, "Tempus Fugit II", a Grumman F8F Bearcat, during a Qualifying run prior to the 2007 National Championship Air Races in Reno, Nevada, USA. 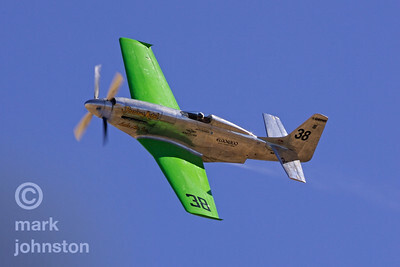 Fred Cabanas and North American P-51D Mustang, "Luscious Lisa", Unlimited Class Race 00, during a qualifying attempt at the 2007 National Championship Air Races in Reno, Nevada, USA. CJ Stephens campaigned Race 114, "Fury", in the Unlimited Class at Reno in 2007, qualifying in 12th place at 411.494 mph, and going on to finished the Unlimited Gold Race in 6th place at 400.280 mph. 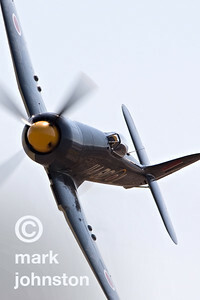 CJ Stephens pilots Unlimited Class Race 114, "Argonaut", a Hawker Sea Fury, around the race course during qualifying for the 2007 National Championship Air Races in Reno, Nevada, USA. 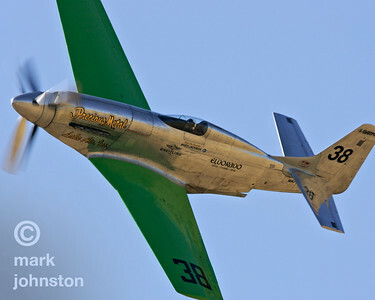 In 2007, Rob Gordon qualified Race 81, North American TF-51D "Lady Jo" at 340.069 mph, placing them 20th in the field. Gordon and "Lady Jo" went on to finish seventh in the Bronze Race at a speed of 319.377 mph. John Penney taxis back into the pits after a test flight in Grumman F8F Bearcat, "Rare Bear", Race 77. Later in the week, Penney flew "Rare Bear" to a win in the Unlimited Class Gold Race at a speed of 478.394 mph.